On May 4, 2014, the D.C. Regional Chapter of the Dramatist Guild of America will host Playwrights: Taking Control of Our Own Fates workshop and the Kennedy Center. 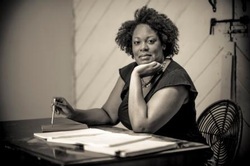 Playwright Jacqueline E. Lawton will take part in the "Playwrights Raising Money" panel along with D.C. area playwrights Kathleen Akerley, Ari Roth, Gwydion Suilebhan, and Anu Yadav. Associate Executive Director of the National New Play Network and Executive/Creative Director of The Welders, Jojo Ruf will moderate. A panel discussion, moderated by playwright Brett Abelman, on the secrets to success in Fringe festivals far and wide. Panelists will include playwrights Stephen Spotswood, Ann Fraistat, Regie Cabico, Bob Bartlett, and Laura Zam. A presentation on the essentials of social media by dramatist and leading social media expert Devon Smith. A panel discussion designed to help playwrights understand the secrets of raising money in support of their work. Moderated by Jojo Ruf (Executive/Creative Director of The Welders and Associate Executive Director of the National New Play Network), playwrights Kathleen Akerley, Jacqueline E. Lawton, Ari Roth, Gwydion Suilebhan, and Anu Yadav. A round-table discussion of local playwright initiatives: their models, missions, challenges, and opportunities. Participants will include Renee Calarco, Caleen Sinnette Jennings, Allyson Currin, Danielle Mohlman, and Joanna Castle Miller. The Dramatists Guild of America was established over eighty years ago, and is the only professional association which advances the interests of playwrights, composers, lyricists and librettists writing for the living stage. The Guild has over 6,000 members nationwide, from beginning writers to the most prominent authors represented on Broadway, Off-Broadway and in regional theaters.